Palmia Observatory: Upcoming UCI and OCA activities; See you at the OCA banquet; Upcoming Algol eclipse observing opportunities; Luminosity functions and do the deep field studies point to just an average, ordinary place in the sky? Upcoming UCI and OCA activities; See you at the OCA banquet; Upcoming Algol eclipse observing opportunities; Luminosity functions and do the deep field studies point to just an average, ordinary place in the sky? the science won out even as the politics often succeeded in minimizing the predicted outcomes and costs of climate change. It was also good to see some of the regular "students". Thanks Arnold, Dave, Scott, Sandy, John C, John G, Tatiana, and Gabrielle. I wanted to discuss just a couple of items that came up at the AAS meeting, but first we should look at the upcoming calendar of events. First, you might consider attending the UCI physics colloquia, this coming Thursday, where U. of Maryland profession Daniel Lathrop will speak. The topic is not listed, but he is an expert in condensed matter physics and his specialty is turbulence, which affects many systems including stars and nebulae. There are also two OCA events coming up this weekend. Friday night is the OCA general meeting, where we will hear about the Sofia flying observatory and on Saturday night, we will be at the OCA Annual Banquet. Sounds like fun, see you there! 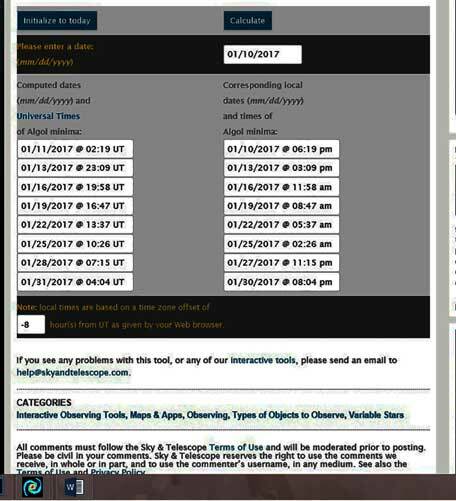 Also you should look at your observing calendar and see if you can fit in a scheduled observing session for the Algol eclipse. I used the Sky and Telescope Algol eclipse minima calculator to get the timing of the next occurring eclipses. See below. So, I spy just two good observing opportunities this month. One on January 27, with minima at 11:15 PM PST, looks great but I will be on an airplane to Washington, DC for the American Physical Society general (April) meeting. The other good observing opportunity is January 25 with minima at 2:26 AM, PST. This is my selected observation opportunity. Now recall that the total eclipse lasts about 10 hours, so about 5 hours before the minima, we should be able to see Algol just as the eclipse begins at about 9:26 PM on Jan. 24. Then depending on how late you can stay up, you should be able to see the end of the eclipse too about sunrise. Wow, what a night! I hope the weather cooperates. 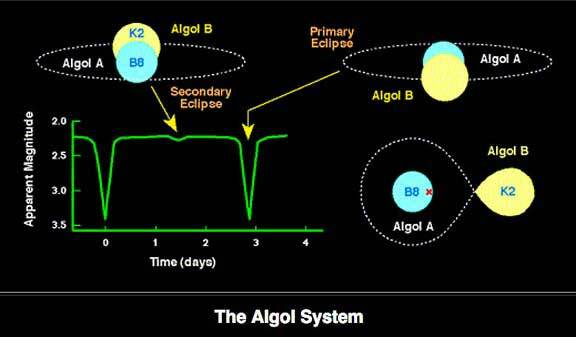 Now just to remind everybody about the reason for the eclipse, check out this diagram, which shows the effect of the orbits of Algol A and Algol B. Source: Internet picture, Courtesy Mike Guidry, U of Tenn.
One topic, that made the cover of Nature Magazine, this week, was first brought to my attention, while at the AAS meeting, a week ago, by Resident Astronomer Peggy, which was described in the January 5 post, was the identification of a fast radio burst with an actual visible object. 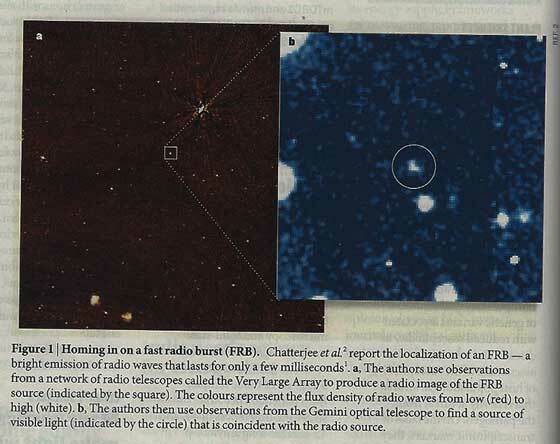 Anyway, I just read in the Nature, Jan 5 edition, which apparently was the original publication, that it had an interesting image showing the radio observation and the visual observation. Check out this image in the report, prepared by almost 30 authors, below. The radio image is on the left and the visual image is on the right side. Wow, when you look at the original images, its really interesting to see what can be learned from just a few blurry blobs of light. I guess I should be learning quite a bit because often that is all I get in my camera too, just a few blurry blobs of light! The other topic at AAS that I found really interesting but could not come to any answer on the topic then. Remember in the last post, we talked about the luminosity function, which sort of describes how the number of visible objects varies as a function of their brightness. Last time, I showed one example of a luminosity function and this time I want to mention another number of objects versus their brightness curve, this time made using the Chandra X-ray orbiting telescope. This deep field data set comes from 4 million seconds of observation time. Wow, and I get tired or my mount drifts off course after just a couple of minutes exposure time! 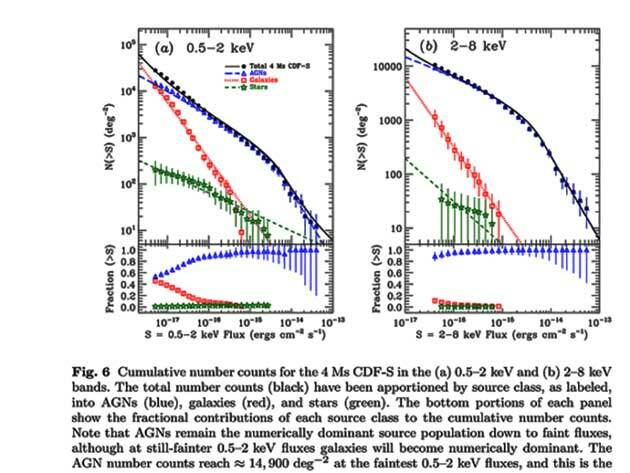 This figure is much like the luminosity function chart we should during the recent posts. This figure is also a good example of what I have talked about many posts in the past, where the first thing the viewer must do is come to understand the units on the x-axis and on the y-axis. The units on the x-axis, after some thought, seem to be pretty obvious, with the flux observed measured in two energy bands, S = 0.5 to 2 keV, or S = 2 to 6 keV. The y-axis just seems to report the number of observed objects at any given brightness. 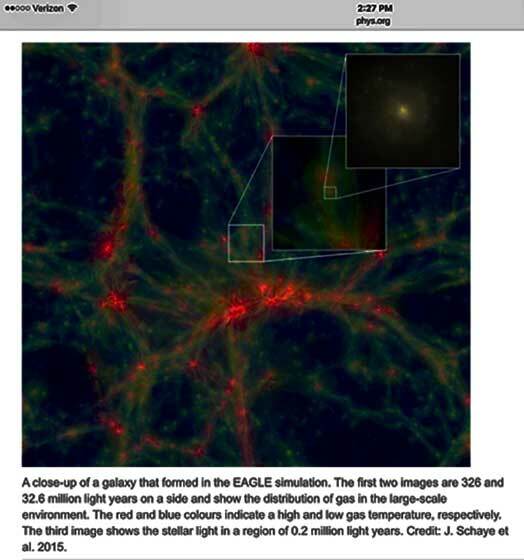 Three different types of objects are being counted in this example: Galaxies, Stars and Active Galactic Nuclei (AGN). Note again, we see the same pattern we discussed last time where the number of dim objects is much larger than the number of bright objects and they seem to follow some well defined logarithmic luminosity function and structure. So, here is my question. One of the speakers at AAS, I'm sorry I don't remember who, mentioned that deep fields, like the Hubble deep field and this Chandra deep field, look at just a small fraction of the observable sky. Could it be, he asked, that we are just by chance looking at a particular spot of the universe that has properties that we interpret as being general and applicable to the entire universe? Wow, could this be the case? I don't know, but consider the image below which shows just one of the many large simulations that are developed to show how the universe and galaxies could form after the big bang. Note how there are filaments and structures and depending on where you were looking you could find yourself seeing different densities and different temperatures and different galactic structures. We know on small scales, like that of the solar system, that the universe is not uniform, and on larger scales there are galaxies and clusters of galaxies. But it is a principle of astrophysics that on the very largest scales the universe is just a uniformly distributed collection of galaxies and dust. So, depending on how deep we look we will see galaxies or clusters of galaxies or just uniform distribution of stuff. So, keep that thought in mind and look at the simulation screenshot below. The size of the small field in this simulation is just 0.2 million light years on each side. The Chandra deep field is about 16 arc minutes in size and finds galaxies at about redshift 3.7, which are about 12 billion light years away. Now, I assume that one can scale up from 16 arc minutes to actual lengths by assuming the distance is 12 billion light years. Then the size of the visible universe in the CDF is about 8 million light years on each side. Now if you compare this to the scale in the Eagle simulation, that would be approximately comparable to the original white square. I don't know for sure if we can just do this scale factor or not, given the expanding universe and all of that, but for a first pass, let's assume that the CDF would match the little white square in the simulation. Now, you can see, depending on where the CDF were pointing, you could indeed see different densities and temperatures. So, let's ask that same question again. How do we know that the deep field surveys by Hubble and Chandra don't just happen to point at a location in the universe where the density and distribution is not as uniform as we currently seem to have evidence for? I don't know the answer, but surely this question has been asked before; the author at AAS said as much. But what is the answer? If you know the answer, please let us know?